"We are facing a paradigm shift which will change the way we live and work," proclaims a recent report on robotics from Bank of America, which touches on the technology's potential to disrupt healthcare and manufacturing. 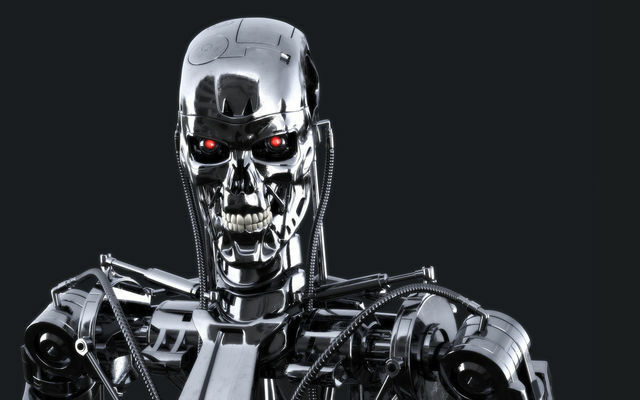 Some of the worst-case scenarios described in reports from Merrill Lynch and Oxford University are reminiscent of the Terminator series. The notion that robots pose a risk to humanity is certainly not new, but it seems to be an idea that is finding new-found credibility recently. An open letter about the risk of autonomous weapons has been famed physicist Stephen Hawking, Apple cofounder Steve Wozniak, Tesla founder Elon Musk, as well as over 3000 AI and robotics researchers. Now, Bank of America's Merrill Lynch is both warning of the threat of robotics while holding up the technology as a promising investment. The firm itself announced this morning that it is debuting an automated investment prototype that will work alongside human investors. "Robots are likely to be performing 45% of manufacturing tasks by 2025 versus 10% today," reads an excerpt of a 300-page report from Merrill Lynch. According to the report, titled "Robot Revolution - Global Robot & AI Primer," the robotics market is set to increase nearly eightfold in a few years, from being worth $10.7 billion in 2014 to $83 billion by 2020. In that same year, the market for AI-analytics is expected to be worth another $70 billion, according to report author Beija Ma, an equity strategist at Bank of America Merrill Lynch. Since 2010, the technological niche has grown at a CAGR of 17%. In healthcare, one of the biggest applications of robots is caring for the elderly. Meanwhile, robots could ultimately help manufacturers save as much as 90% of wage costs. Robotic-assisted surgery is another prominent area. Only recently, the company Medrobotics announced that it won $25 million in funding for its Flex robotic endoscope system. The report cites a Pew survey that finds that nearly half of industry professionals worry about the potential of robots to disrupt the job market. The report specifically cites the potential of robots to take over a significant number of jobs in the healthcare and manufacturing sectors. Countries that invest extensively in smart applications are expected to fare well financially while those that don't won't. The falling costs of robots could help drive that trend. The report states that, for instance, an advanced robotic welder costed about $133,000 in 2014--a 27% reduction from the $182,000 such a welder had in 2005. Meanwhile, the capabilities of such robots are roughly doubling every decade. Still, some computer science luminaries think that the extensive use of robotics could itself be problematic. "If we build these devices to take care of everything for us, eventually they'll think faster than us and they'll get rid of the slow humans to run companies more efficiently," said Steve Wozniak in Vice. In a similar vein, a 2013 Oxford report predicted that artificially intelligent robots could eventually do 47% of jobs, including tasks such as nonroutine tasks, ranging from legal writing to medical diagnoses. Technologies like IBM's Watson could ultimately assist in diagnosing patients while also identify cancers in radiology scans. Robots could also help with communicating and communicating with patients and delivery of medical supplies. In addition, telepresence robots are already enabling doctors to communicate and interact with patients remotely. Jobs that are low-paying face the highest risk of being replaced through automation. This is worrisome for the United States, according to the Bank of America report, because many of the new jobs being created are "low-paying, manual or services jobs which are generally considered 'high risk' for replacement." There are nine pure-play robotics companies mentioned in the report, several of which have links to the medical device industry, including the OEM Intuitive Surgical and the automation firms Rockwell Automation, Mitsubishi Electric, Nabtesco, and Omron. Learn more about medical technology trends at BIOMEDevice San Jose, December 2-3.